It takes a lot of grit for any entrepreneur to build a business today; it’s even tougher to be a woman in a male dominated industry and an industry dominated by national competition to boot. Leanna Godley has done all of that. For more than a decade, she’s grown Goddess Office Products against the longest of odds. It’s the kind of company that many people assume had died out a long time ago, given the online options and brick and mortar superstores against which she competes daily. Yet here she is, peddling everything from pens to paper towels coast to coast from the 10,000-SF Jacksonville facility her company has called home the past three years. Asked what’s enabled her to still be in business, she credits her faith and her father Leandrew Gray for teaching her to help herself. “My father, I tell people all the time, he was a crazy little man,” she said. “He always had that entrepreneurial spirit. I’ll never forget our Saturdays, I was 11 years old, we’re going door-to-door selling Kirby vacuum cleaners. When I was a teenager, I remember he had a full-time job, but he also had buildings that he cleaned. After graduating from Little Rock Central High School and the University of Central Arkansas, Godley worked for corporate oil in Texas before the lure of entrepreneurship pulled her back home and into office products. Hers was a meager enterprise, but one that held obvious growth potential. That niche market was government clients, which operate under procurement guidelines that favor minority owned businesses. Today, the bulk of company sales are through government contracts, from city hall to the feds. 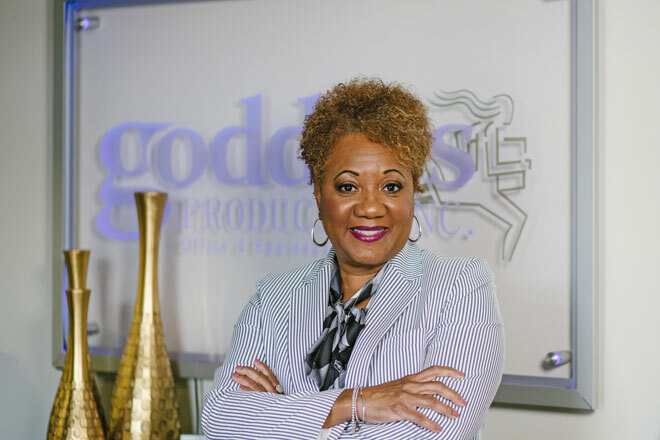 As Goddess Office Products has grown into a national market footprint, Godley’s competition has grown right alongside, so she’s constantly drilling her 17 employees on how to out-service the big box stores.